An op-ed at The Independent by their Middle East correspondent Robert Fisk (Jared Kushner’s connection to an Israeli business goes without scrutiny – imagine how different it would be if that business was Palestinian, Jan. 11) includes the suggestion that American Jews working in the White House as Mid-East peace negotiators would be more loyal to Israel than to their own government. In the first paragraph, Fisk expresses concern that “the four principle US peacemakers” under Bill Clinton “were all Jewish Americans” and derides as fanciful “the myth that American peacemaking in the Middle East was even-handed, neutral, uninfluenced by the religion or political background or business activities of the peacemakers”. There was a time when we all went along with the myth that American peacemaking in the Middle East was even-handed, neutral, uninfluenced by the religion or political background or business activities of the peacemakers. Even when, during the Clinton administration, the four principle US “peacemakers” were all Jewish Americans – their lead negotiator, Dennis Ross, a former prominent staff member of the most powerful Israeli lobby group, Aipac (The American Israel Public Affairs Committee) – the Western press scarcely mentioned this. In further support of his argument, Fisk then quotes Israeli Meron Benvenisti writing, in Haaretz in July 1993, that “it is hard to ignore the fact that manipulation of the peace process was entrusted by the US in the first place to American Jews…” and warning of “the tremendous influence of the Jewish establishment on the Clinton administration”. Of course, whether you’re a Jew like Benvenisti, or a non-Jew like Fisk, complaining that Clinton’s Mid-East peace advisers are Jews, and warning of the undue influence these Jews have on the US President, is the definition of antisemitism. Whilst Fisk’s criticism of Ross’s AIPAC connections is legitimate (as are questions about Jared Kushner’s Israeli financial and business ties), questioning the loyalty of Ross and the other Jewish peace negotiators – suggesting they can’t be trusted to negotiate fairly with the Palestinians because of their faith – crosses the line. As CST wrote, “the ‘dual loyalty charge is one of the oldest antisemitic canards” – one, we believe, that is inherently inconsistent with the values of any respectable media organisation. We’ve complained to Indy editors about Fisk’s evocation of this toxic calumny, but haven’t yet received a reply. Fisk shows a greater loyalty to his Palestinian and Muslim friends than he has ever shown to Britain. He doesn’t see that Britain potentially faces similar threats to those that face Israel, and it would make little difference to him if he did. You expect objectivity from Fisk? How naive! Fisk’s problem is that because he’s biased and a bigot, he assumes that everyone else is the same. Sad old man. I didn’t say it was relevant. I simply said he was a sad old man. The relevant part is his bias and bigotry. “the four principle US peacemakers” – principle? What an utter moron. Robert Malley’s apologetics for Arafat’s refusal to make peace would make him Fisk’s kind of guy, if only he weren’t Jewish. It doesn’t seem to bother Fisk that George Mitchell, considered a prominent Arab American, was a Middle East peace envoy. The same George Mitchell, also of Irish ancestry, was also involved in negotiations over the troubles in Ireland. But, hey, at least he’s not Jewish. 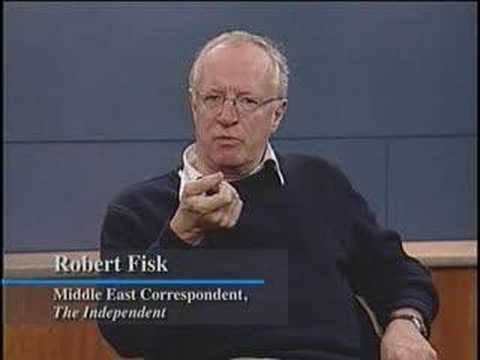 Was there ever a time when we all went along with the myth that Robert Fisk was even-handed? Fisk’s thinking is a rather antiquated prejudice. It took Secretary of State George Schultz to break the State Department’s longstanding, informal ban on any Jewish employee working on anything related to Arab-Israeli issues. The myth that the US, or any country for that matter, is “neutral” or “even handed” in its international relations was a fabrication. Each country looks to its own interests first, and to pretend otherwise is naive in the extreme. What the US could be is an “honest broker” – defined as the one who speaks uncomfortable truths that require the parties’ acknowledgment. Recent examples are (1) Israel is here to stay, (2) the Jewish historical connection to their land is undeniable, (3) Jerusalem is Israel’s capital and it will continue, uniquely, to safeguard everyone’s rights to worship in their holy places and (4) losers don’t get to dictate peace terms. Is Robert Fisk aware that Arabs are in control of most of the world’s oil, and that the Western dependency on said oil has only instilled extreme ideologues (i.e. dictators and self-declared monarchies) in control of hundreds of millions of people? Just how many articles have been written about the slave labor used in Qatar to build FIFA World Cup stadiums for the White and Privileged to enjoy in 2022? I would think that’d be more up his alley in terms of bitching about unseen human rights abuses. Fisk is an anti-Semite. As sad and stupid as they come. The problem with Fisk’s argument is he uses it to deflect the fact Muslims, Arabs, across a broad band were participants or involved in the “process”. The ideal was to cultivate relations between the Israelis and all peoples for peace. To suggest there was another agenda is not proven and Fisk offers no proof. The alternative is the pseudo process known as the two state solution which Abbas, PA, Hamas, other Jihadi and like Muslim Brotherhood groups, Hezballlah and Iranian revolution cells (Should they have been included?) take to mean an end game in which Jews are excluded from all parts of Jerusalem and Palestine and 5 million refugees or more, will surge across an open border to go back to Israel which will become part of Palestine; when in fact only 30,000 would actually be “returning under the right of return. For them diplomacy is a weapon to achieve their goal of a fully occupied Israel and an annihilation of the Jews. What men and women like Fisk don;t want us to notice with all their finger pointing is exactly what President Trump’s initiatives have revealed a Palestinian people in part enslaved by their own “brethren” made to live in UN camps as political hostages for a future that would take 100 years, we are at 70 years and counting. Its time for the Palestinians to get off the pot.